I have a friend, Tek Young Lin, who is a born storyteller. He can weave a tale with every nuanceâ€”the smell, the expressions, the detailsâ€”all brought to life. He can twist a yarn about anything or nothing. In fact, he tells a wonderful Daoist story about collecting holes, and how his best friend almost tumbled down one that they were capturing and throwing onto a truck. Tek’s storytelling follows in the footsteps of his tradition. He is a Hakka. Many people have never heard the name. It refers to a nation of nomads, a so-called â€œGuest Peopleâ€ composed traditionally of mathematicians, storytellers, astrologers, and doctors. The Hakkas are a great example of how social conditions affect martial reality. Through millennia, they have been pushed, squeezed and bumped ever southward. Huge revolutions and natural disasters drove them out of their traditional habitats. It made them clannish, too, even creatingÂ â€œone-name-villages,â€ with everyone in a given town sharing the same family name. 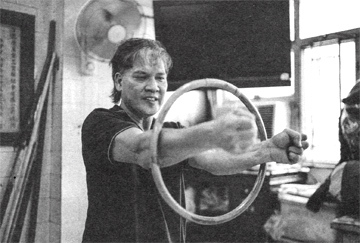 Typically Hakkaâ€”what they were forced to do actually became their method of self-protection. They kept all marriages inside their clan, developing a ritual toâ€”occasionallyâ€”accept a non-clan member to the inner circle. This practice still lingers in the secretive inclusion ceremonies for some Southern styles of Kung Fu. 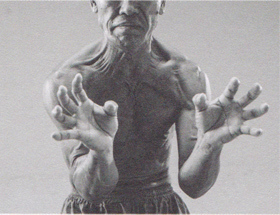 Restricting themselves to clan houses, walled residences and group-owned lands reflected itself in styles of Kung Fu with a tight â€œenvelope”â€”like Wing Chun or White Craneâ€”styles which closely protect the body while also keeping the perimeter completely covered. An opponent, like a Mongol warrior or an enraged peasant, must close the gap to get his licking. While Northern Chinese, who themselves â€œhelpedâ€ the Hakka to give up their homes and homelands, may be best identified with military weapons, much of Hakka fighting concerned itself with urban weapons such as short knives and iron rods, steel fans and short wooden crutches (tonfa). Stories Iâ€™ve read of teachers’ fighting experiences center around knife fights with gangs of bad boys and lightning fast techniques to overcome dreadful odds. Hakka techniques invariably favor speed, angles, traps and fast feet. The Horse stance is rarely emphasized in Hakka style and is used more for leg training than for combative foot patterns. As the Hakka moved through the layered landscape of China, the martial masters acquired a unique blend of skills and weapons from both war and farming. The battlefield spear was coupled with the spade, the straight sword with the sleeve knife. 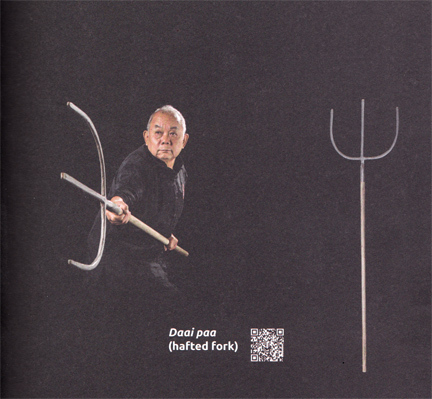 The iconic Hakka weapon, a big trident called the Paa, was often associated with hunting tigers. My friend, Tek, moves gracefully through a linked chain of stories and anecdotes. At one point he decided he wanted to learn the straight sword. I held one out to him, just to touch. The moment he grabbed it his arm dropped. â€œItâ€™s terribly heavy, isnâ€™t it.â€ Though he never learned the weapon, Tek reminded me of those amazing storytellers who recite the entire Romance of the Three Kingdoms performing all voices, male and female, battle scenes and the conferences of the great. Then, when the story is done, they move on to the next village where they may again breathe life to the warrior, and share the valor with the audience. Watch for news of our upcoming book, a tribute to Hakka martial arts. Posted December 10, 2016 by Plum Staff. Comments and trackbacks are open. Follow the comments feed. Tagged with: Bai He, hakka kung fu, Pak Mei, Southern Fist, Southern Kung Fu, white crane kung fu.